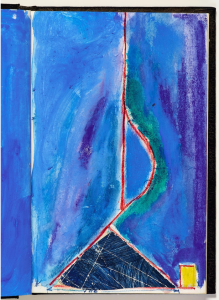 “Untitled”, from Sketchbook #10, p. 13 (1943-93), gouache and watercolor on paper. 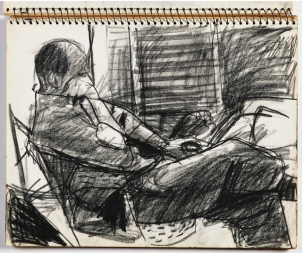 Diebenkorn drew constantly and filled the sketchbooks over his long career. They include over a thousand drawings reflecting his interest in both nature and the built environment of California, as well as figure studies, portraits and experiments with abstract expressionist color fields. Some were done quickly with broad strokes, while others are finely detailed. “Untitled” from Sketchbook #2, p. 33 (1943-93), gouache, watercolor, crayon with graphite and collage on paper. The sketchbooks range in scale and size from the spiral-bound to beautifully embossed journals. 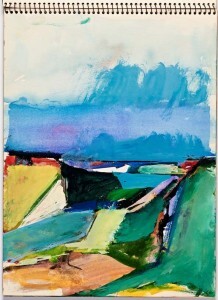 They had been kept in a cardboard box in the home of Diebenkorn’s widow, Phyllis. Before her death in January of this year, Phyllis donated the entire collection to Stanford. The Cantor has taken apart one of the books and displayed it in its complete form so that viewers can get a sense of the intimacy of Diebenkorns’ visual diaries. Because of the delicate nature of the sketchbooks, only a one-page spread of the rest of the books will be on view. The museum has digitized all 29 books and made them available in the gallery on touchscreen kiosks, so visitors can leaf through each of the books digitally. The exhibition also includes loans of some of Diebenkorn’s earliest works–all executed in the 1940s during his Stanford days and many on display to the public for the first time. Also on view in the same gallery is the Cantor’s recent acquisition, an early Edward Hopper painting from 1913 entitled “New York Corner.” Hopper made the work when he was just 31 and it is said to be the first work in his representational style. Diebenkorn was influenced deeply by the work of Hopper, and viewers will have the rare opportunity to study the two artists’ work in close proximity. “Untitled”, from Sketchbook #20, p. 45 (1943-93), crayon on paper. Richard Diebenkorn (1922-1993) was born in Portland, Oregon and grew up in San Francisco, where he attended Stanford University (class of 1949). “Untitled”, from Sketchbook #2, p. 26-27 (1943-93), graphite on paper. 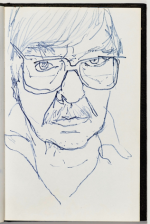 Richard Diebenkorn: The Sketchbooks Revealed will be on view at The Cantor, on the Stanford University campus at 328 Lomita Drive at Museum Way from September 9, 2015 through February 9, 2016. The museum is open Wednesday – Monday, 11 am – 5 pm. Admission is free. All images gifts of Phyllis Diebenkorn, @The Richard Diebenkorn Foundation. The eagerly anticipated Anderson Collection at Stanford University will open to the public on September 21, 2014. Admission is free but timed tickets are required for weekends. 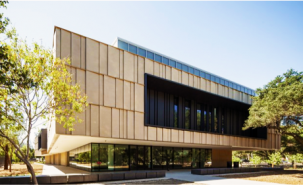 In 2011, the Andersons promised 121 works by 86 artists to Stanford, and the University constructed a permanent building designed by Ennead Architects next to the Cantor Arts Center exclusively for the gift. The Anderson Collection was assembled over the past 50 years by Bay Area locals Harry W. “Hunk” and Mary Margaret “Moo” Anderson, along with their daughter Mary Patricia “Putter” Anderson Pence, and is considered among the world’s most impressive private holdings of 20th Century American Art. It includes 837 works by 203 artists.